I love Mondays and Thursdays because I get to publish new podcast episodes! 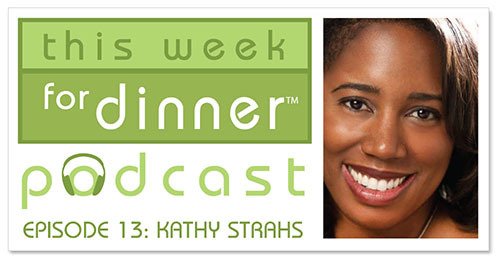 Today the show features my colleague and dear friend Kathy Strahs. Kathy has THREE food blogs (crazy woman! ), has authored two beautiful cookbooks, and recently launched her own publishing company Burnt Cheese Press. She’s got lots of smarts and lots of heart, which means she has a lot of good to share with the world. Kathy talks about her new business with me on the show, and, of course, recipes and kitchen tips! My kitchen tip for opening jars that I shared with Kathy on the show…she tried it right after we talked and I received a very excited text from her about how great it worked!